Free Shipping Included! Bluejoy Jewelry Genuine Natural Turquoise Bracelet 8mm Perfect Round Beads with Lobster Clasp by Bluejoy at Envy This Stuff. MPN: B07F7K13YB_US. Hurry! Limited time offer. Offer valid only while supplies last. Gorgeous Bracelet - Hand crafted to perfection, this bracelet brings a pure look of natural turquoise gemstone with unique characters. Decorated with two silver plated ending beads, the lobster clasp elegantly connects the bracelet and secures the jewelry piece for daily wears. 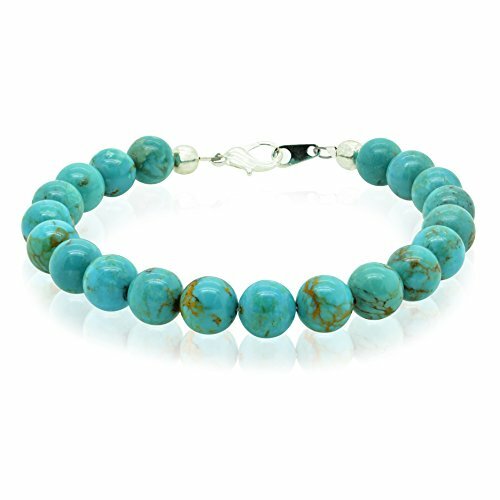 This bracelet features pure blue turquoise impressions with gorgeous natural gemstone matrix, which makes any outfits combination stand out fashionably. Bracelet Details - 7.5'' (19cm) Bracelet Length (fits most wrists), Silver Plated Ending Beads & Clasp. Hand Made in U.S.A.
Gemstone Details - 100% Natural Stabilized Turquoise, Premium Quality, Professionally Hand Cut & Polished. 8mm Perfect Smooth Round Shaped Bead. Gemstone Variation - Please understand this product is made with natural turquoise gemstone, every single bead of the bracelet is unique and there will be slight variations for each jewelry piece we sell, but rest assured that our stone-expert team has made every effort to guarantee the consistency and quality of all finished pieces from BLUEJOY. Please refer to description picture for a good representation of the product. Satisfaction Guarantee - Every piece comes with premium suede pouch to protect and store your jewelry piece. Enjoy our world class customer service and Satisfaction Guarantee & 30-Day Hassle Free Return Policy. If you have any questions about this product by Bluejoy, contact us by completing and submitting the form below. If you are looking for a specif part number, please include it with your message.